What could be more cosy for the chook that decided to come live with us. It is not quite the coop that I wanted but it will do. I had searched far and wide on the internet for the right coop for my tiny brood of backyard chooks (which of course totals one chook at the moment). I really wanted this coop that I found on the Appleton’s website. You only have to read their website to realise how superior their coops are compared to the type that we ended up buying but Appletons are in Nelson and I live a long way from there. They do flat pack their coops for freighting but the cost was already quite high without the freight (you pay for quality) and being impetuous, I didn’t really want to wait. So we ended up going to our local RD1 store on Saturday morning and found this one in stock (flat packed of course). A quick phone call to my brother and I had someone to put the coop together for me the next day. (Husband Haitch was sick so couldn’t do it.) I was a little worried as I have had problems in the past with imported kit set products where screws and other such bits were missing and almost impossible instructions supplied but although the instructions were not the best, all the bits were there and we did find a place for each one of them. And the coop ended up looking like the picture on the box and all the doors and things fitted well and opened and shut where they should so he did a brilliant job! And as you can see, Hannah Hen is very happily pecking away inside the coop at her pellets and little pile of kitchen scraps and wanders in and out at her leisure. We have decided not to shut her in at night at the moment as we want to leave the coop available for the rest of the brood while they get used to living at our house and thought it easier that she stays sleeping in our garden for now. That way we can keep her and the new ones separated for a while and hopefully get used to each other. We now have two additional coops. We bought this one because it was bigger and then we bought this one later when we got baby chicks who couldn’t find their way up the ramp. 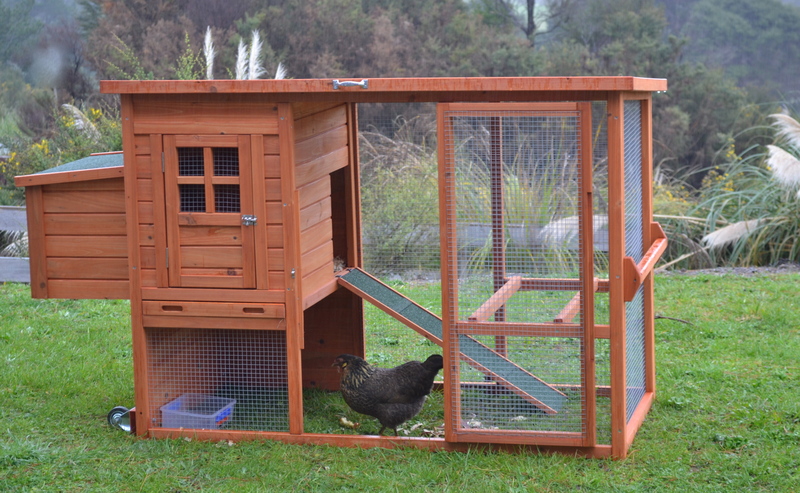 Categories: Coop | Tags: Chickens, Chooks, coop, Hens | Permalink. Well, I don’t actually have a brood yet. I have one chook. But then again, I am not even sure if I actually have her. She turned up at our place a few weeks ago and made herself at home in our garden. Well, I think she has made her home here. She appears every day from the same area of the garden and when she has finished foraging on the lawn, she wanders back down to the same place and loses herself in the shrubs and grass cover. Maybe she is just visiting from a neighbouring property. Maybe she just comes up here to get away from the other chooks. Maybe she is the lowest in the pecking order and she comes here for some respite. But then again, the nearest neighbour is at the bottom of a steep hill and she would have to transverse among the compact native regrowth to get up here. I think she is a bit short and heavy to be doing that every day. I prefer to think that she has chosen to live here. It is winter in New Zealand at the moment and I feel sorry for her being out in the cold and the rain. So we have decided to buy her a coop to keep her warm and safe at night and of course she will remain a free range forager by day. So how does one chook make a brood? Well it doesn’t. And when we bought the coop, of course we got one that can hold four to six chooks. So I am currently looking online trying to decide which breed of chook will make up the rest of my tiny brood. Categories: Chooks | Tags: Chickens, Chooks, Hens | Permalink.